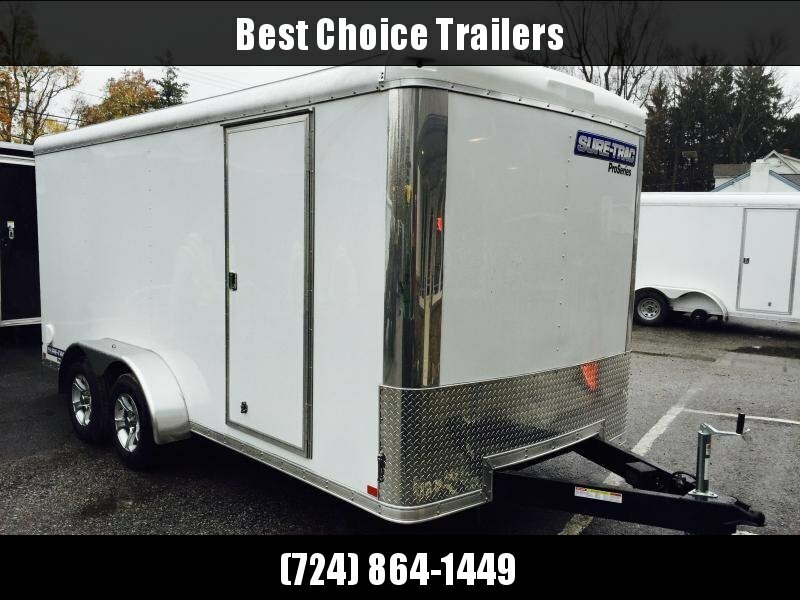 We have enclosed cargo trailers from simple to stylish. 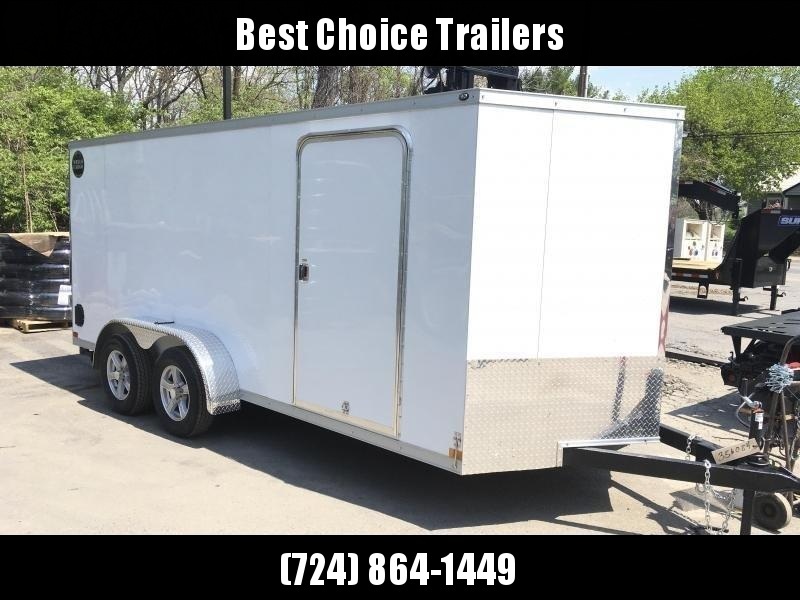 Our sizes range from a 4x6 up to a 8.5x53', and weight ratings from 2000# to 21000#. 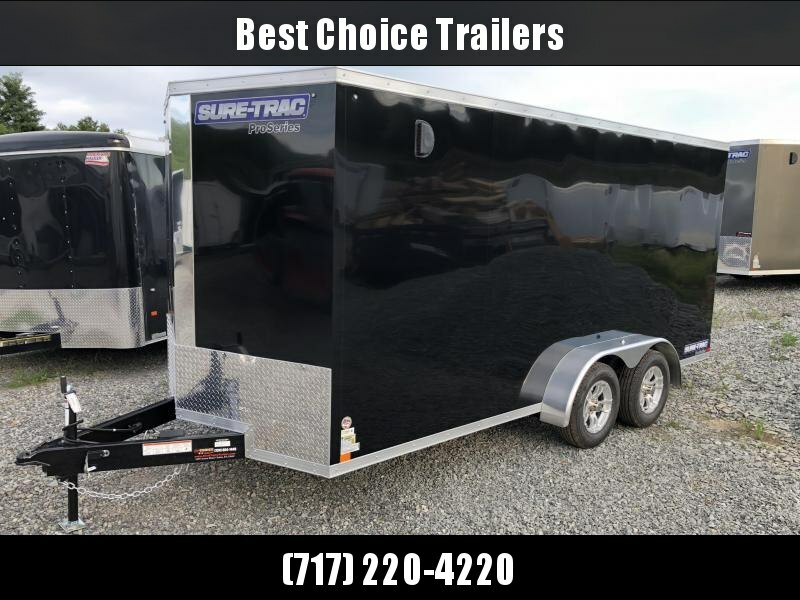 Our brands include Sure Trac, Neo, and Lark United. 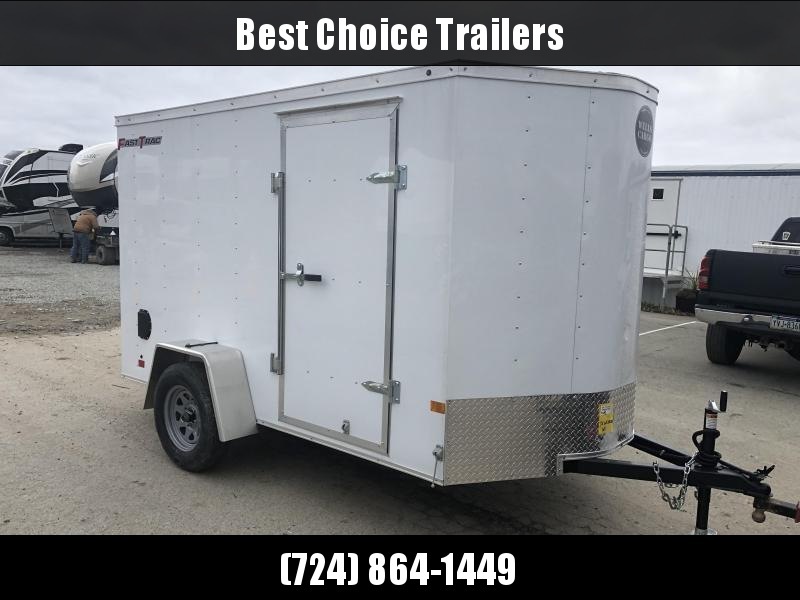 Generally an enclosed cargo trailer is used for a variety of applications, but is defined by being dry box on wheels that is road legal, usually has a aluminum exterior, a side and rear access, and is sufficient height to stand up inside. 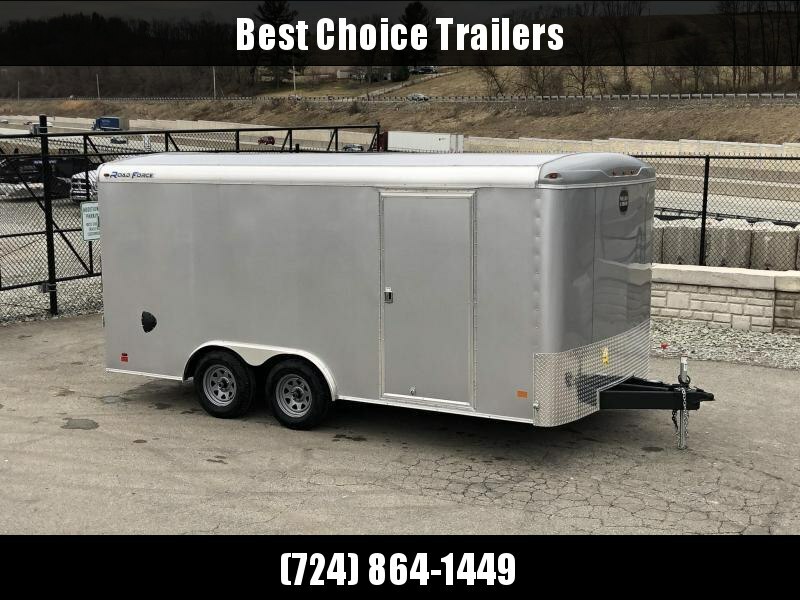 Enclosed cargo trailers are often hard to find used as people can always use dry storage, particularly when it's also road legal and doesn't require a building permit. 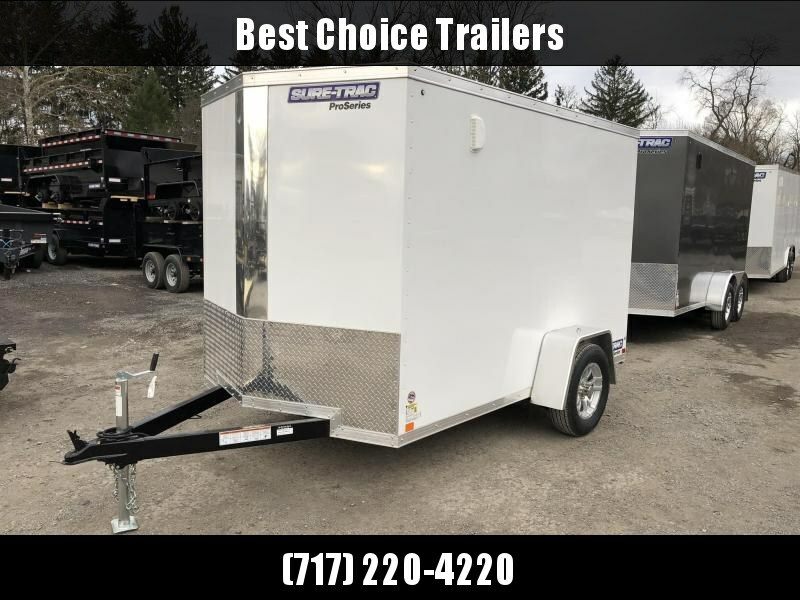 Cargo trailers mainly come in 2 flavors - enclosed cargo (trailers under 8' width for general applications) and enclosed car trailers (generally 8.5' width, come with a beavertail, HD ramp, D-rings, etc, setup for a car). 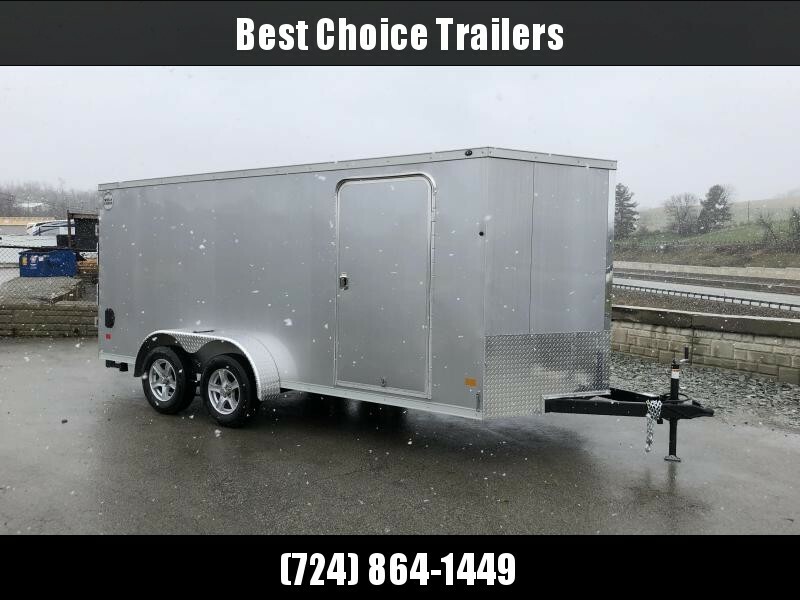 The most common sizes tend to be 5x8, 5x10, 6x10, and 6x12 in single axles, and 7x14, 7x16, 8x16 in tandem axles. 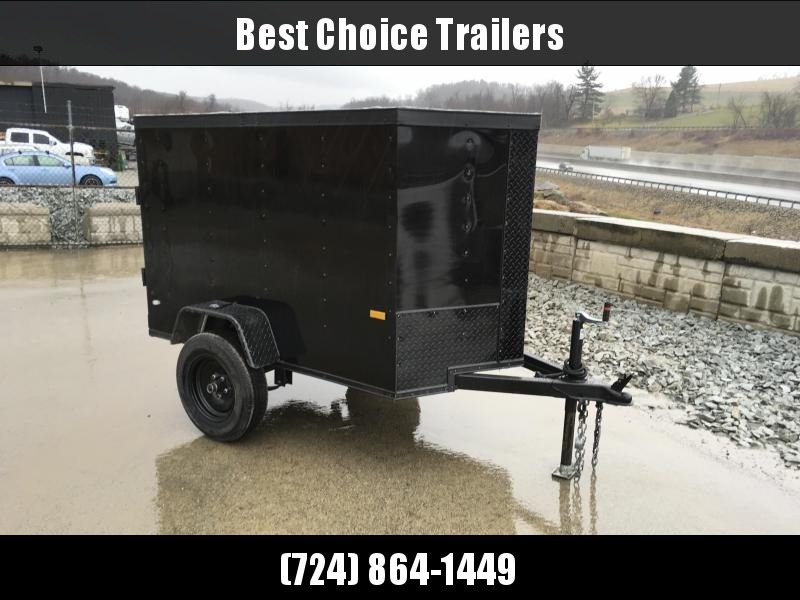 Typically most single axles cargo's do not have brakes and are 2990# GVW, and can haul about 2000# (with tongue weight). 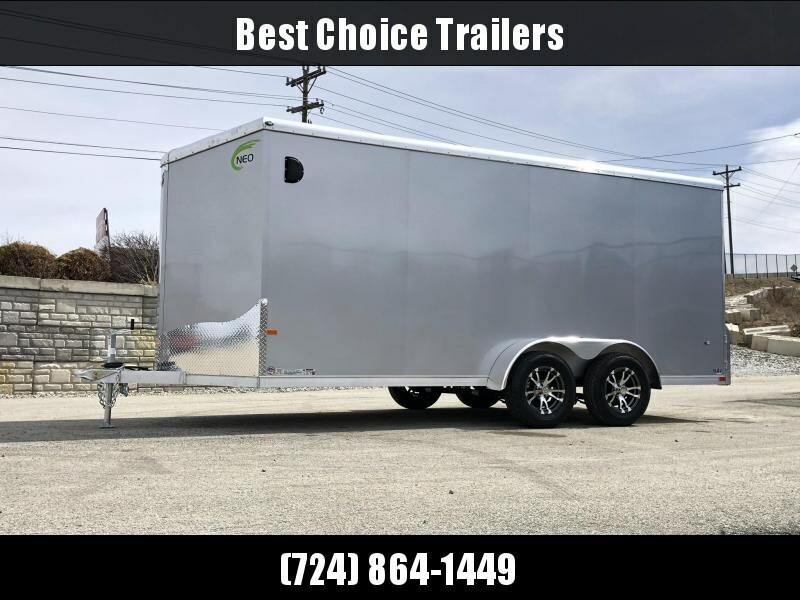 Most tandem axle cargo's are 7000# GVW and can haul about 5500# (with tongue weight). 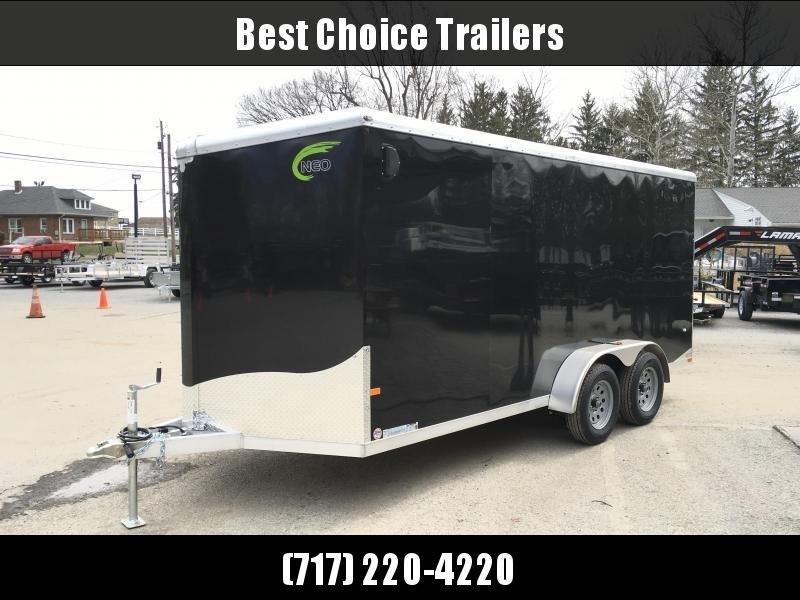 Most enclosed car trailer are either 7000# or 9990# GVW (recommended), but can be 12000-16000# for commercial applications. 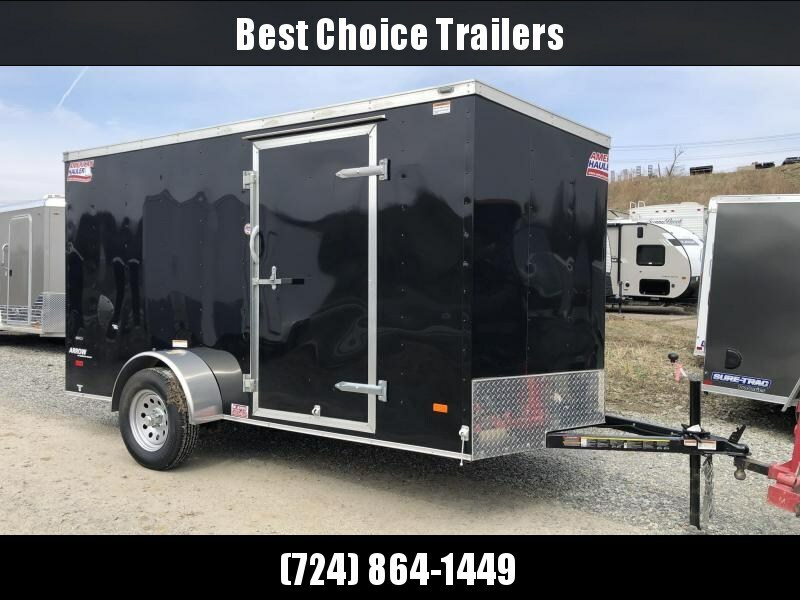 Most enclosed cargo trailers will have either a rear barn door (swing to side) or a ramp door w/ spring assist (hinged at bottom), with the ramp door being the overwhelming majority. 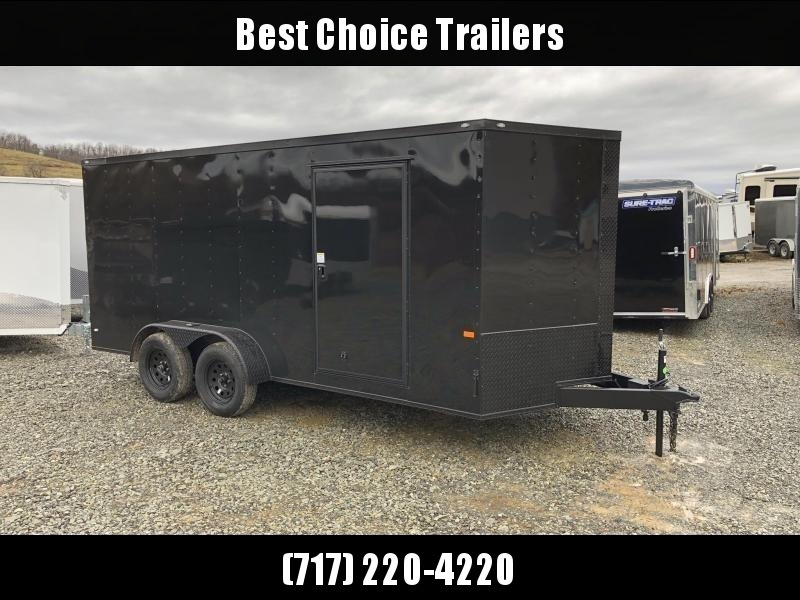 In recent years a "V-nose" has become an often preferred nose style, although a traditional radius front is still better suited for many commercial applications (we stock both). 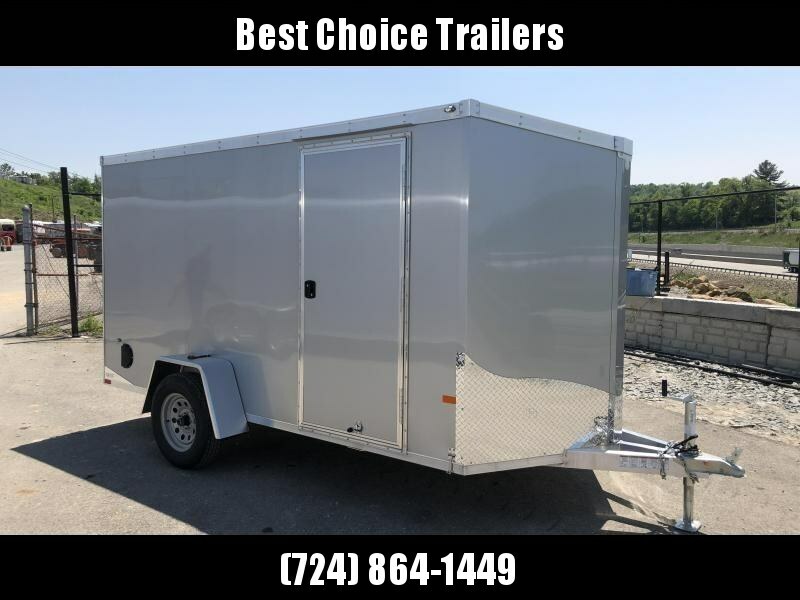 A V-nose generally implies a flat top roof design, while a radius/"flat" front generally entails a round top roof style (although other variations exist). 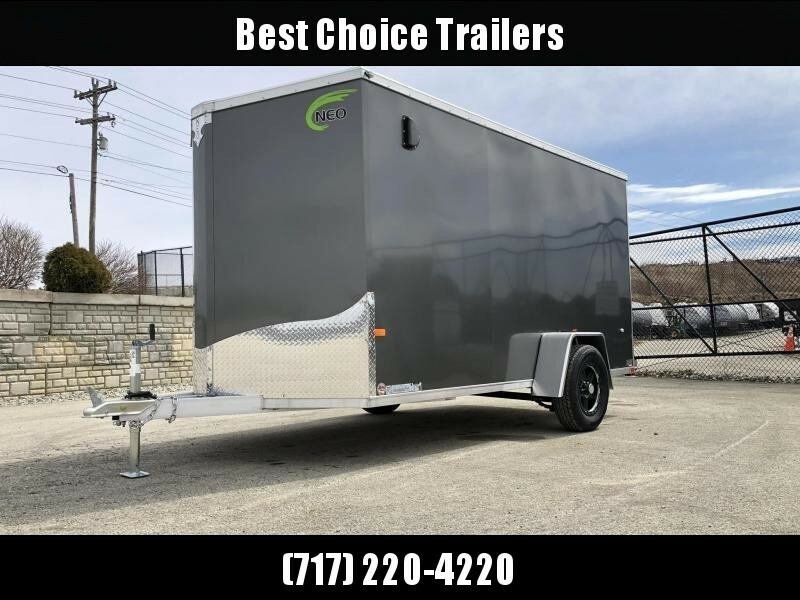 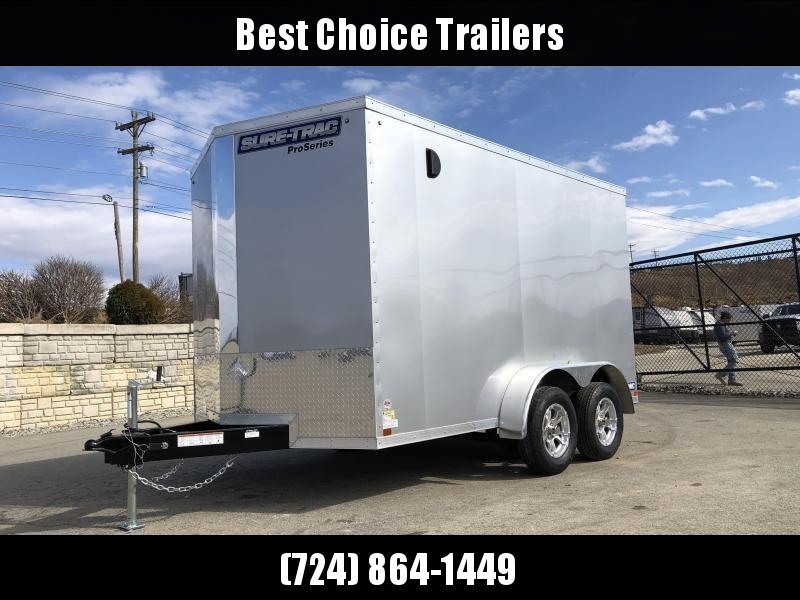 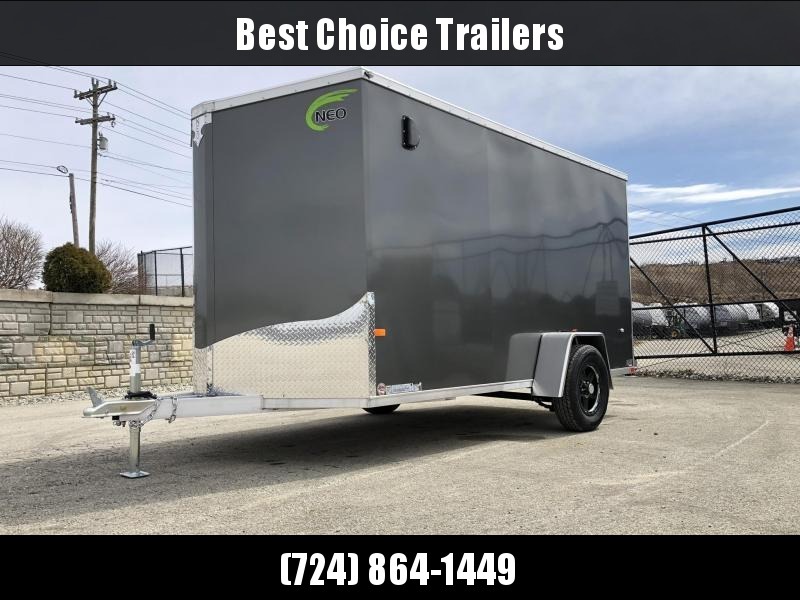 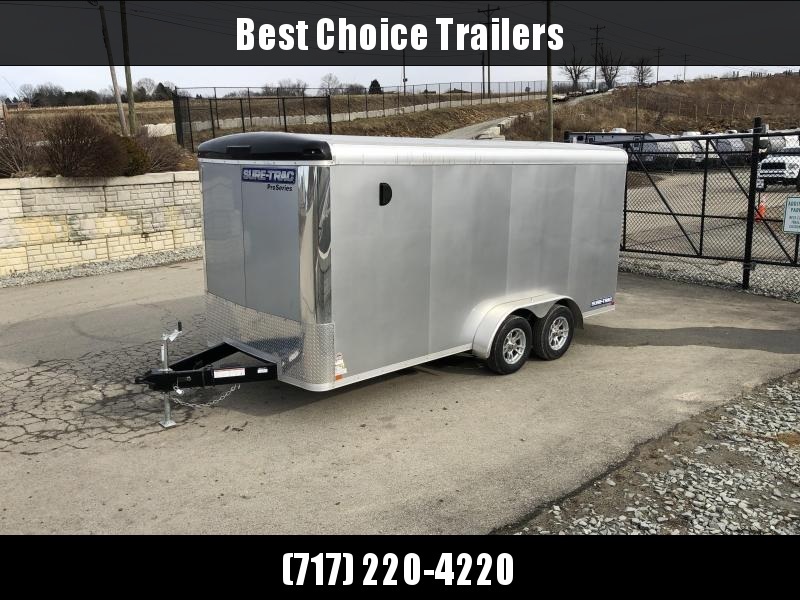 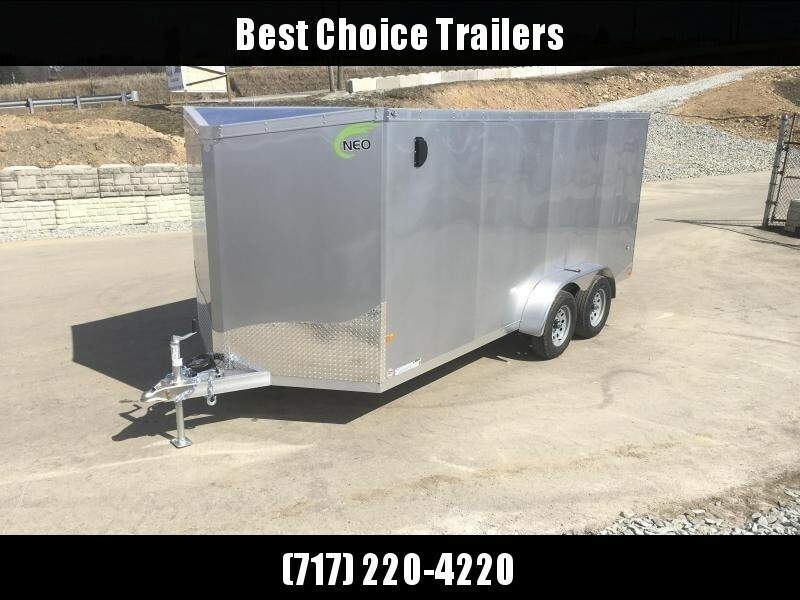 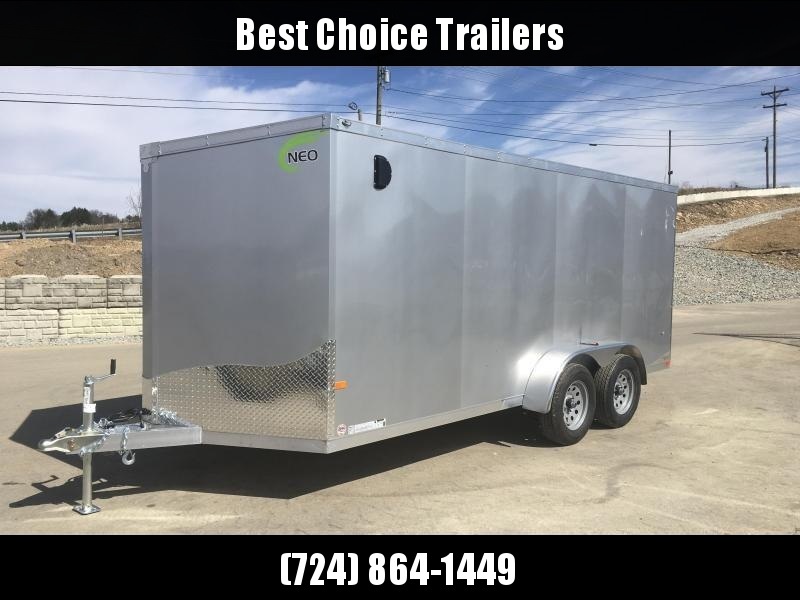 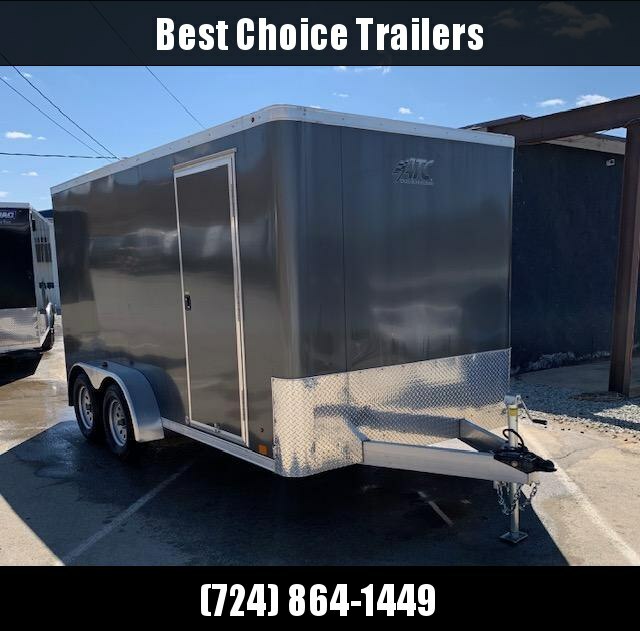 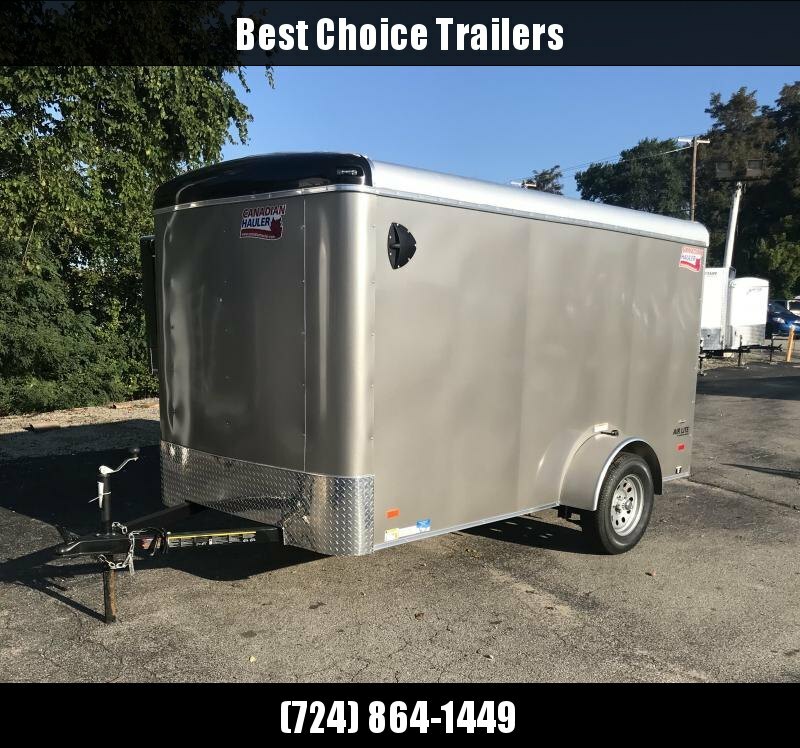 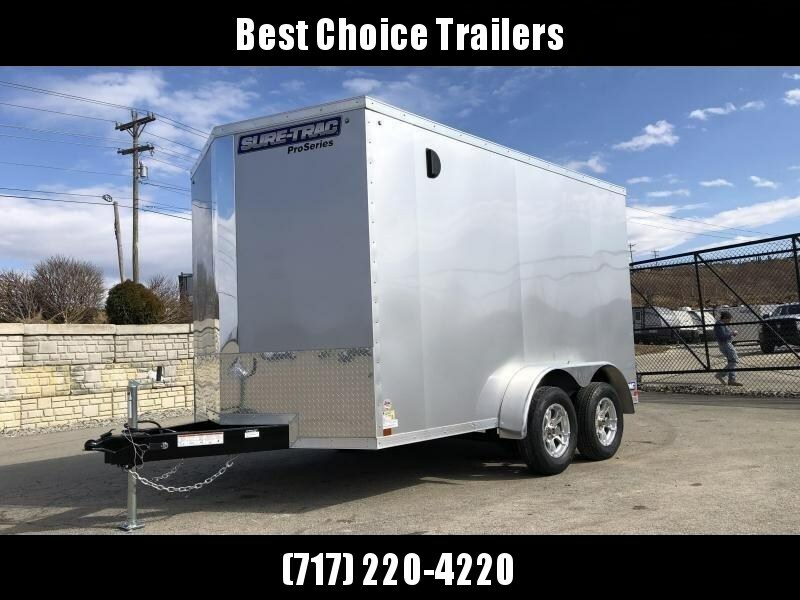 Enclosed trailer frame are most commonly steel with an aluminum exterior, however, we also keep a full line of Neo aluminum cargo's and car hauler's in stock. 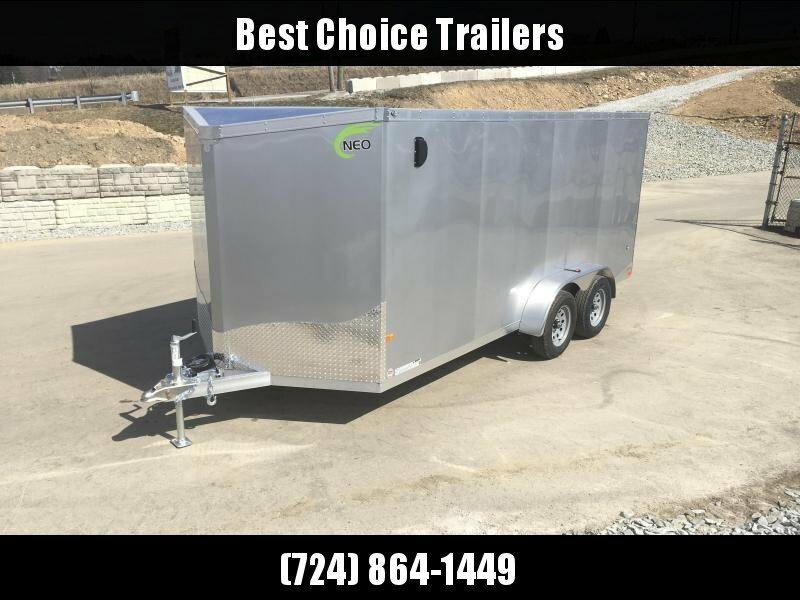 Aluminum trailer's often weigh less, are more corrosion resistant, come with more standard features, and often have better craftsmanship. 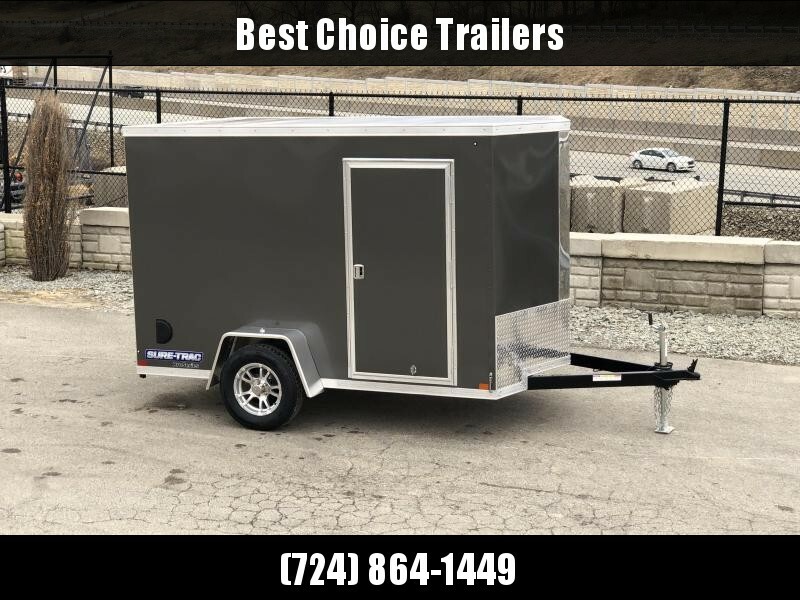 One common "issue" of enclosed trailers are keeping them light enough to pull, yet heavy duty enough to hold up to commercial use. 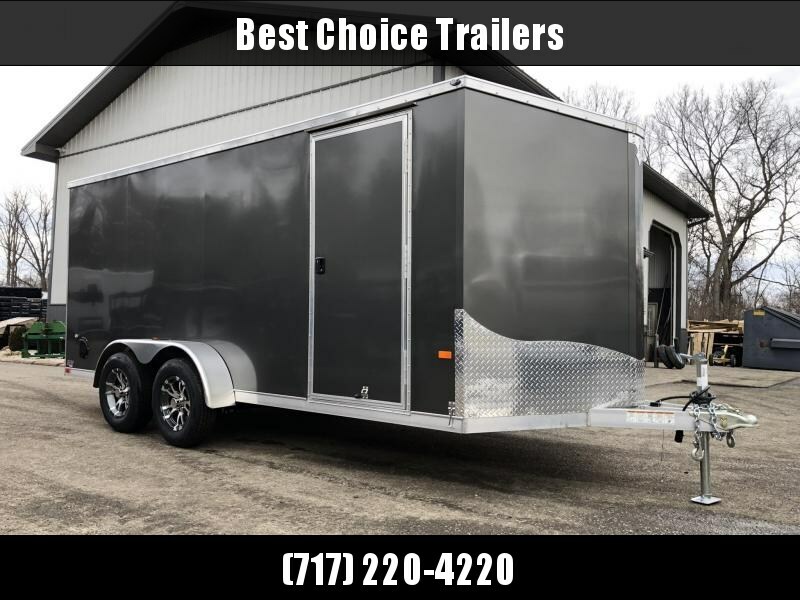 This segment of the industry has also seen an influx of junk flood the market - beware what you buy. 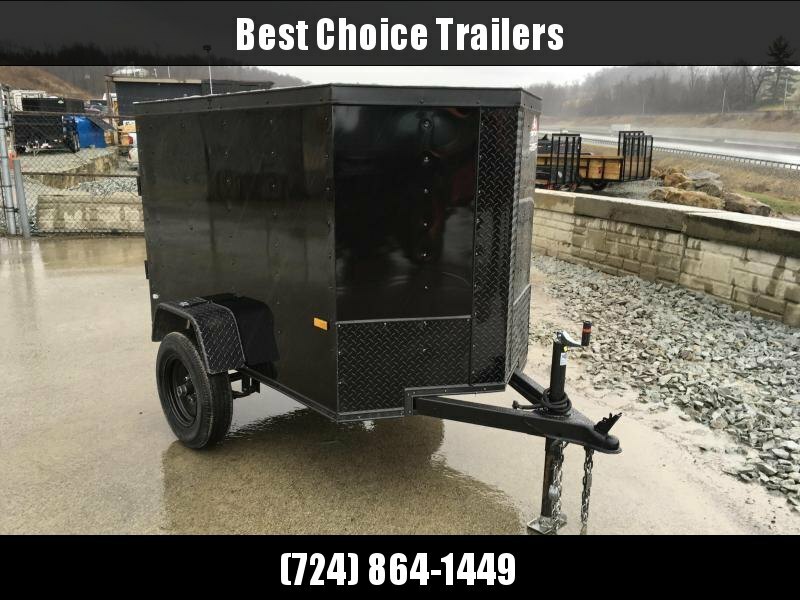 If you don't see what you are looking for, give us a ring as we surely can get it or build it. 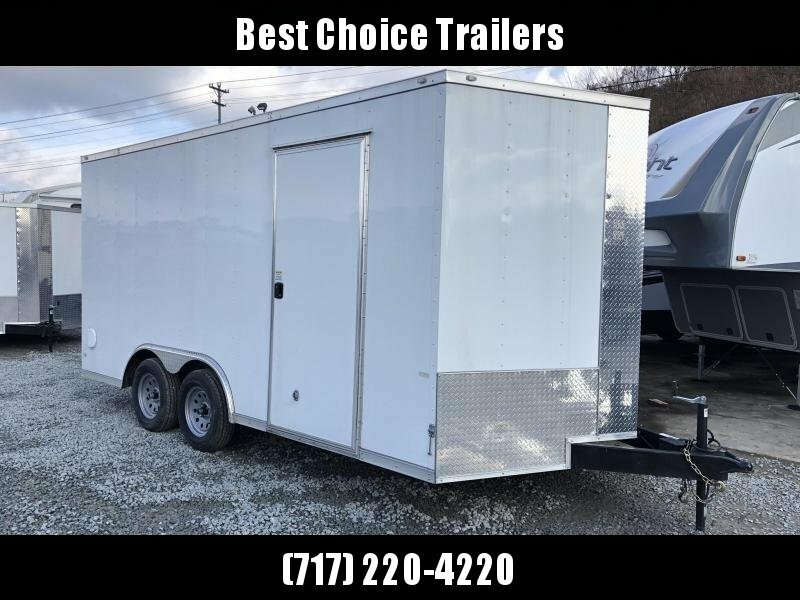 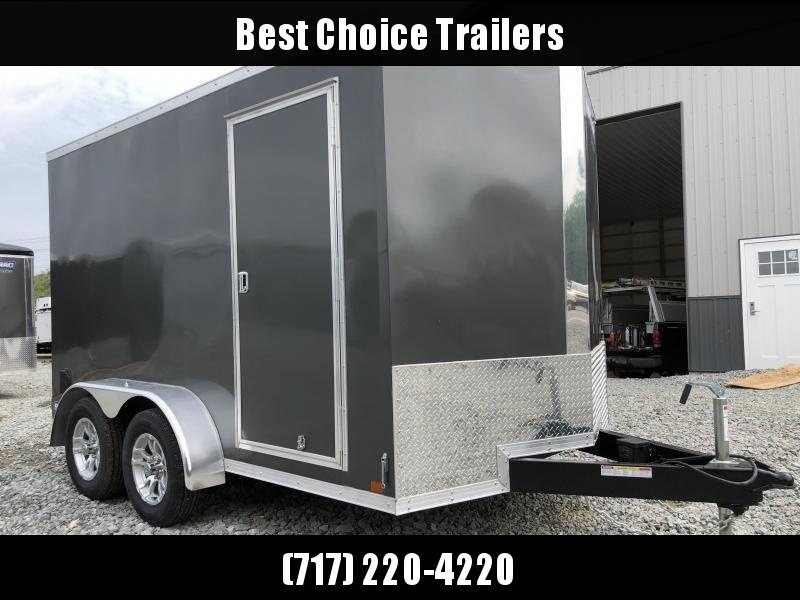 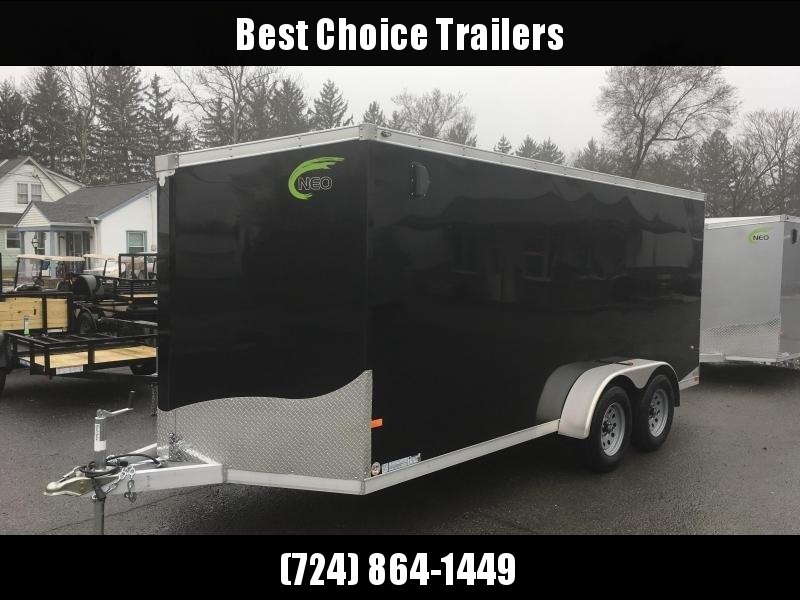 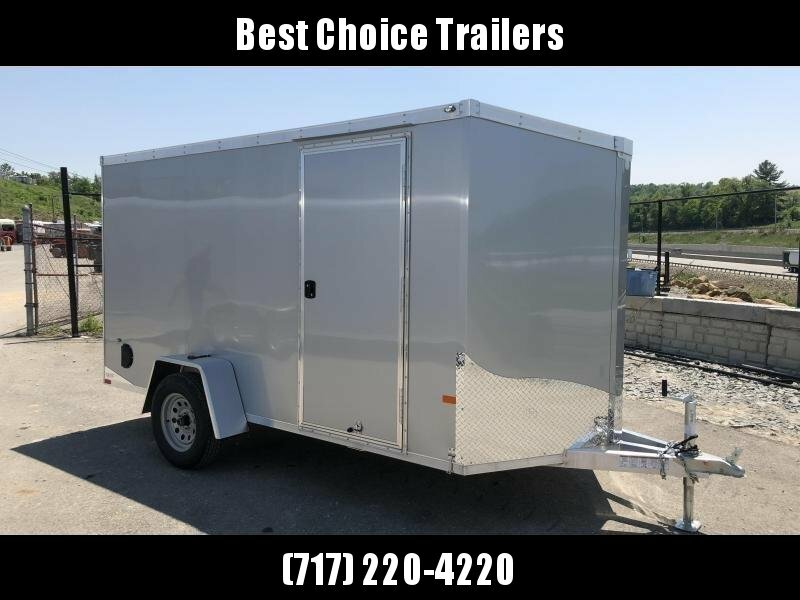 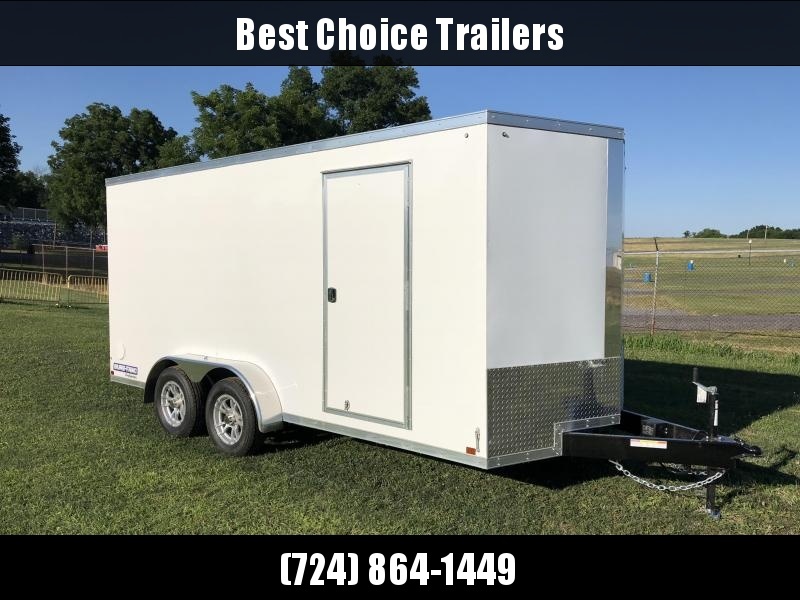 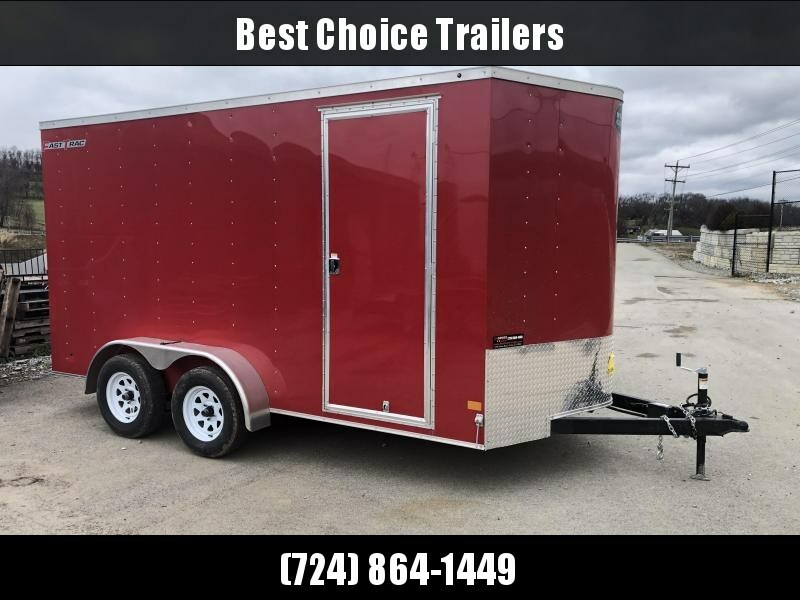 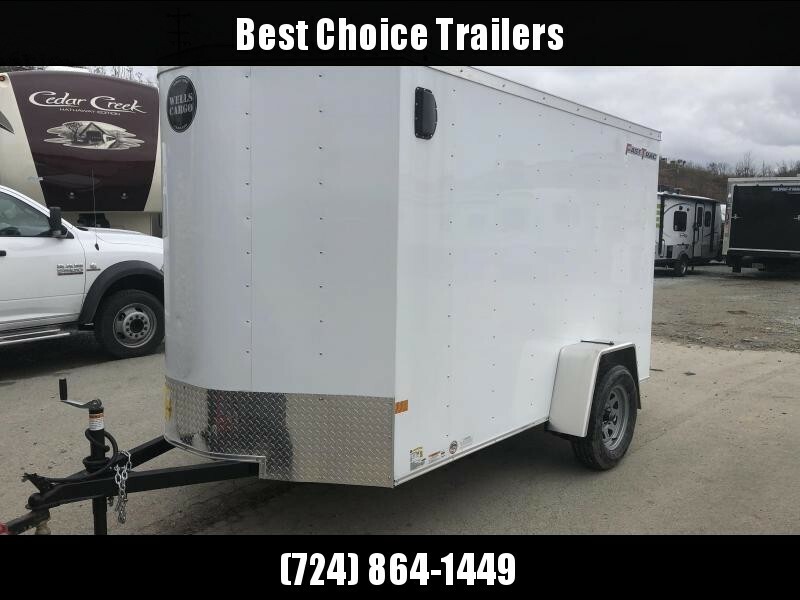 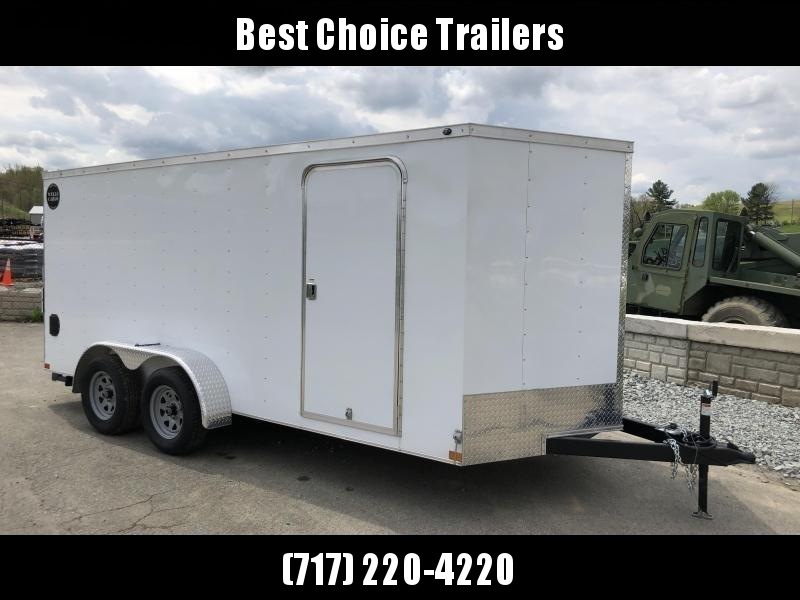 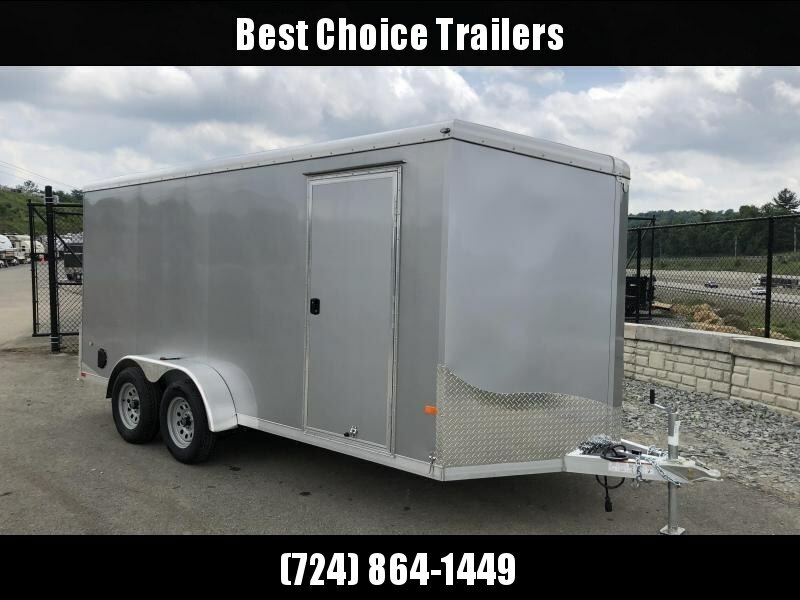 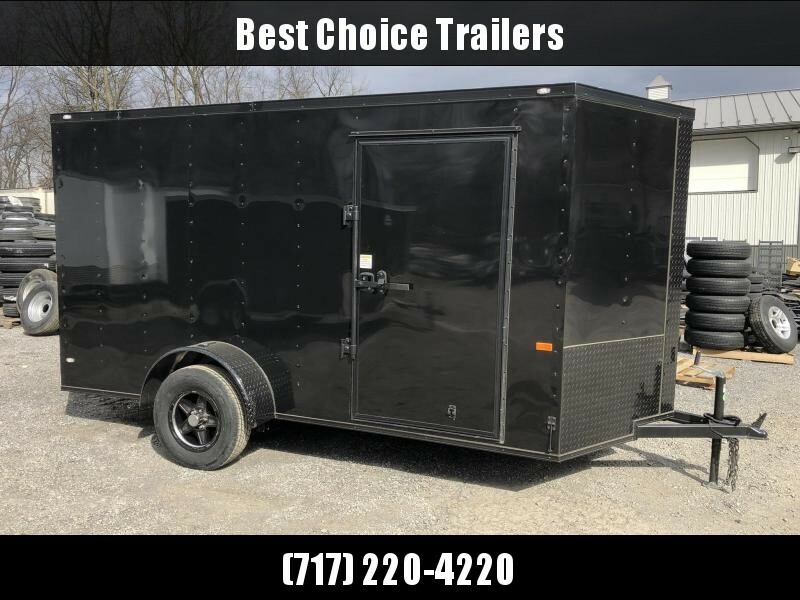 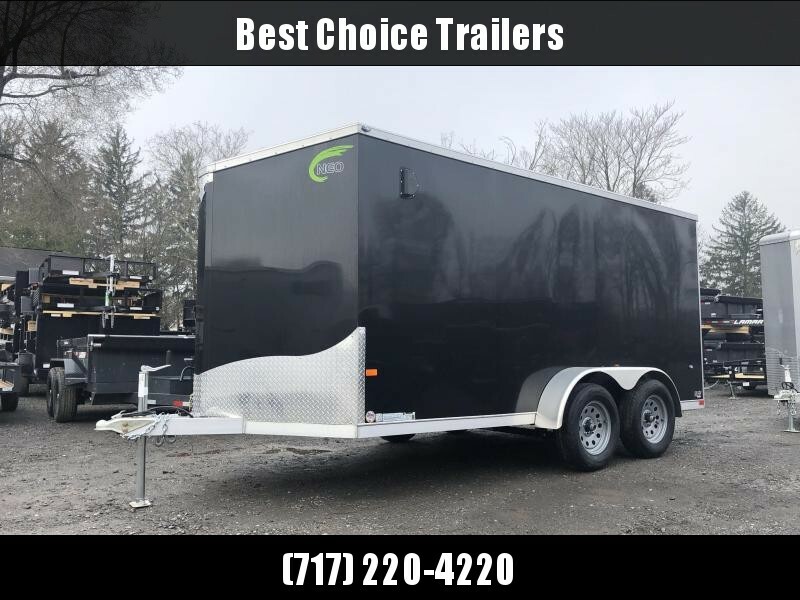 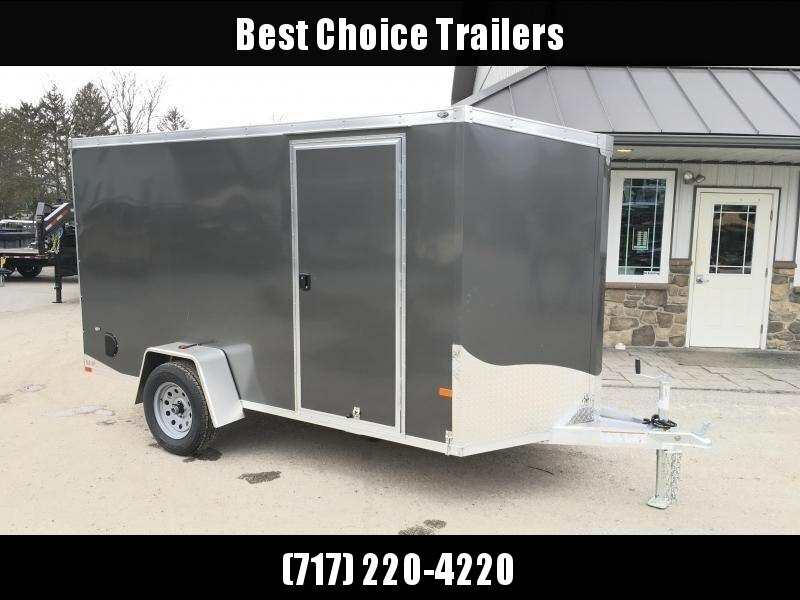 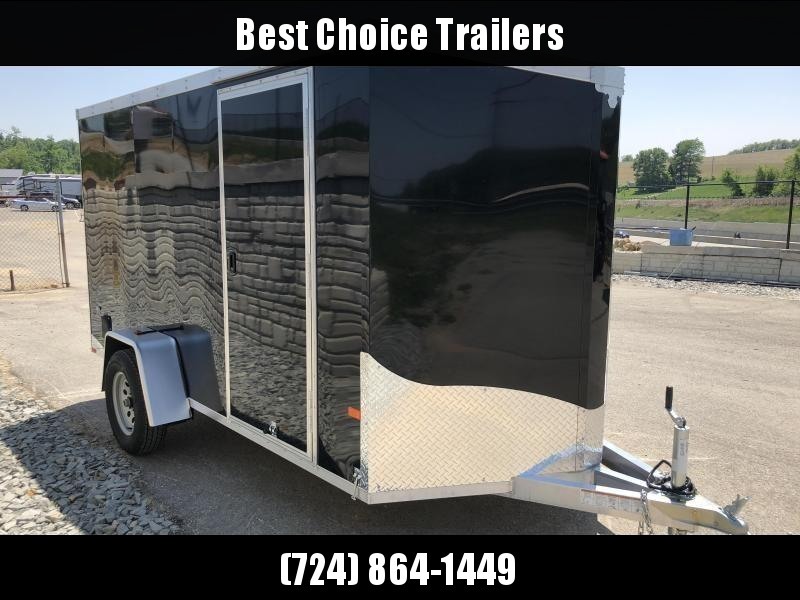 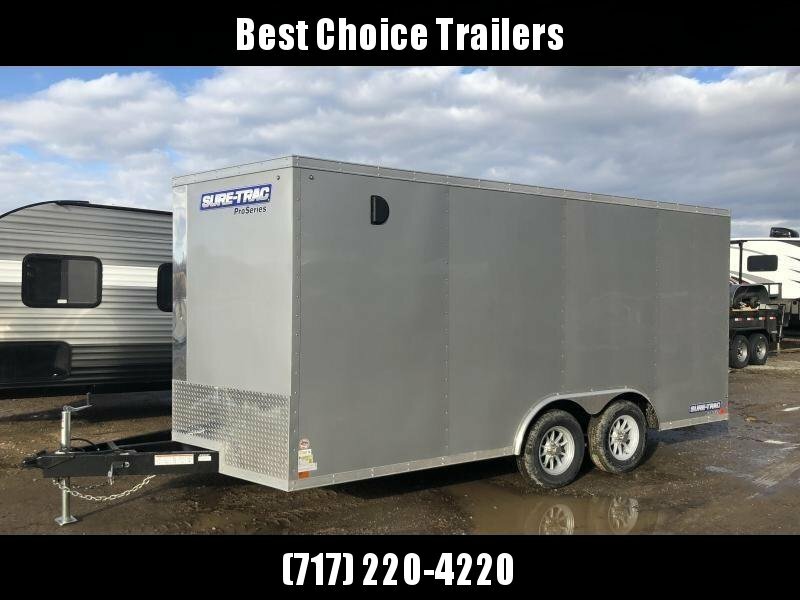 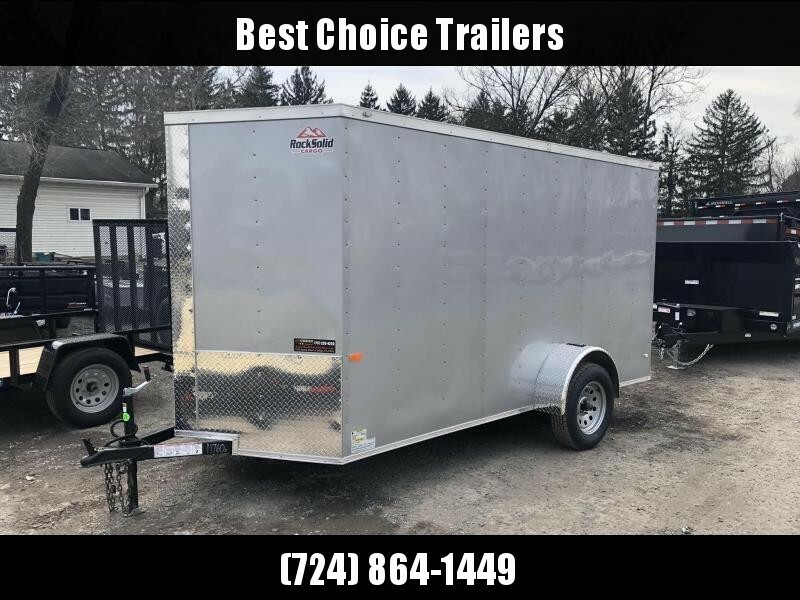 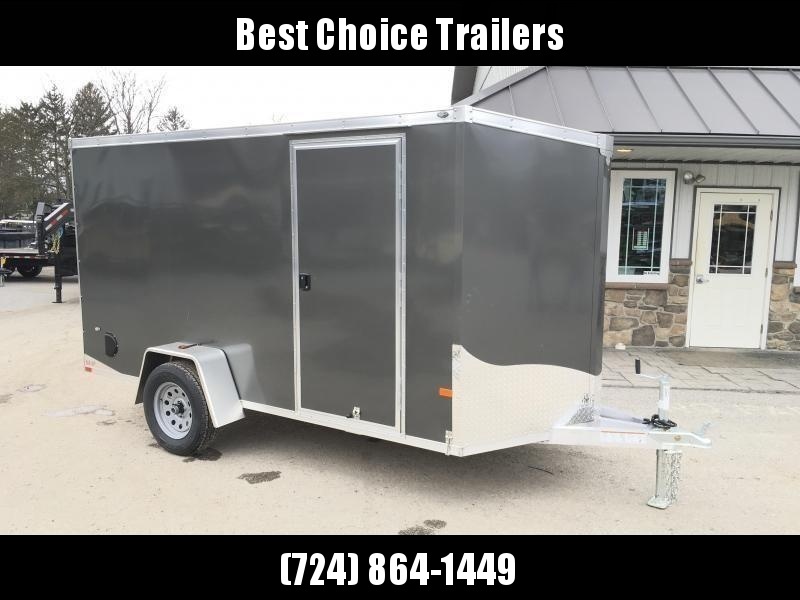 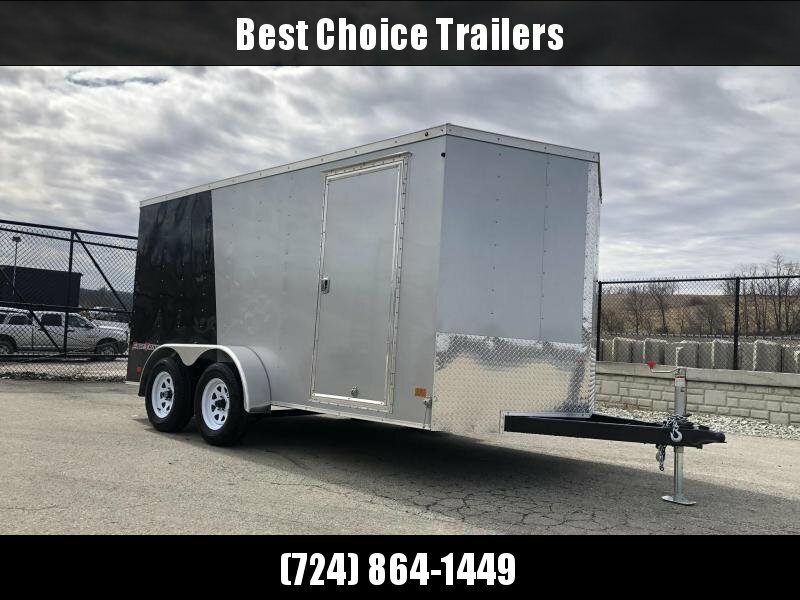 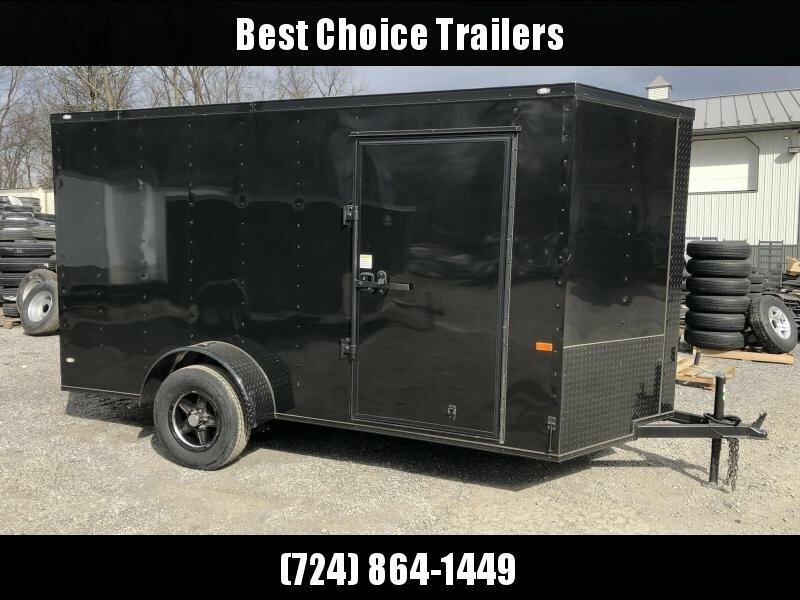 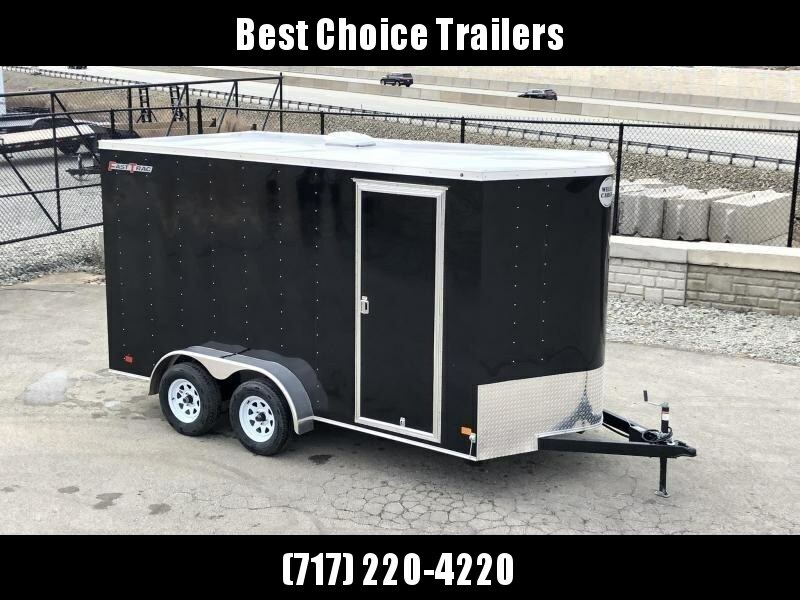 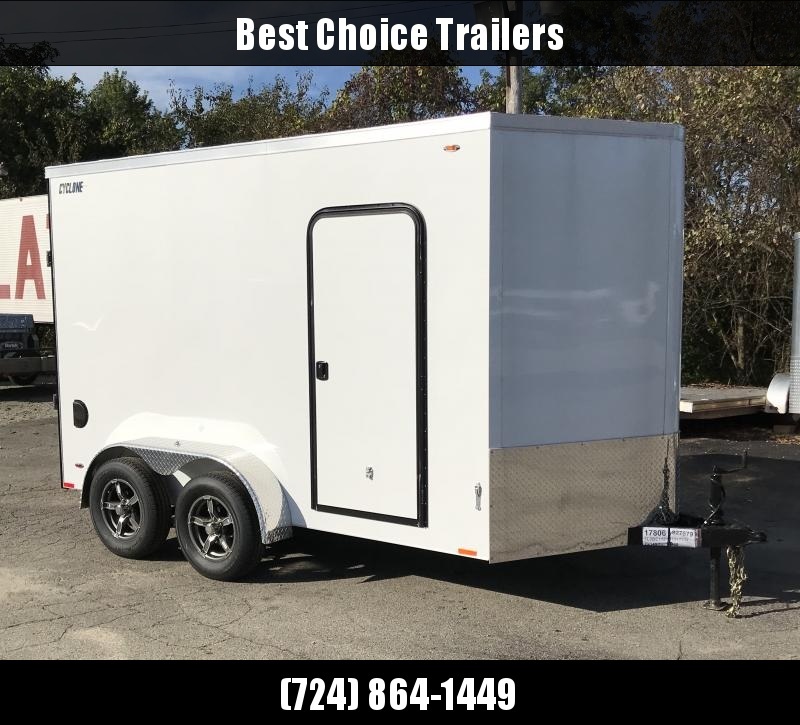 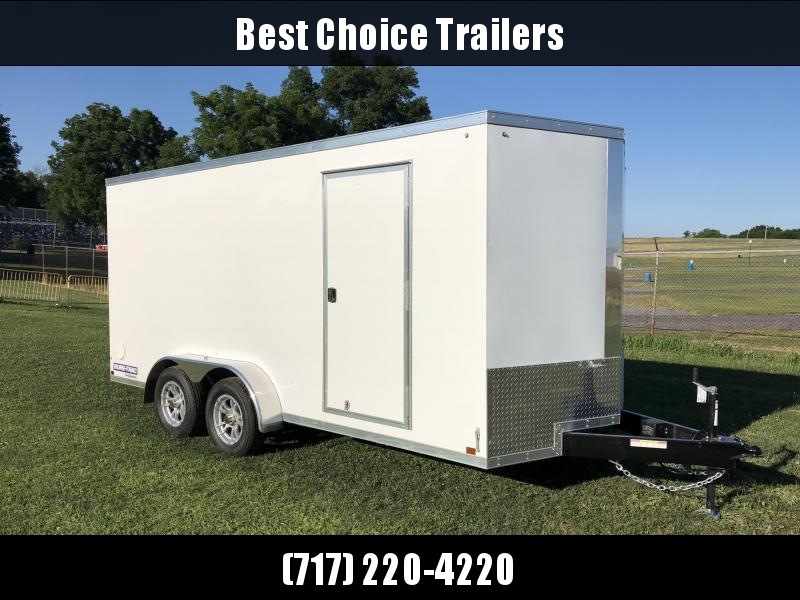 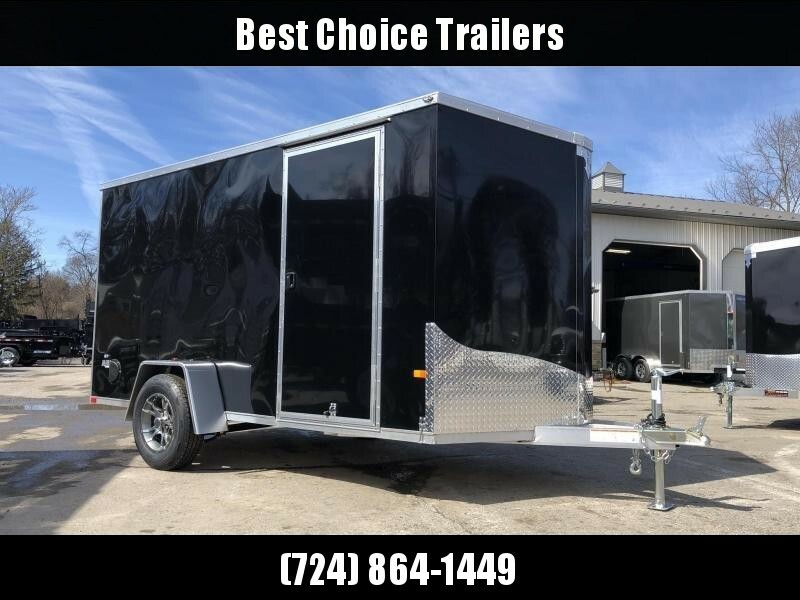 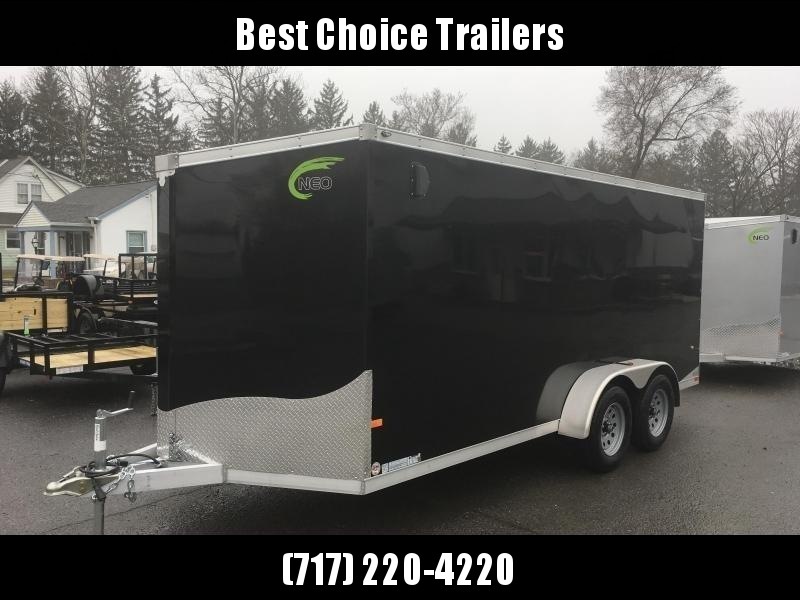 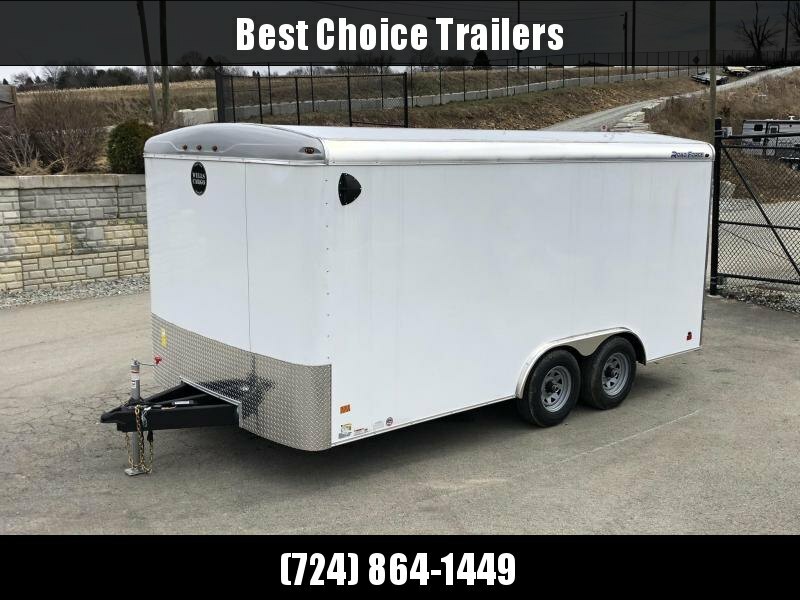 Cargo trailers come in so many sizes, colors, weight ratings, styles, ramps/barn doors, heights, interior/exterior finishes, material types, prices, etc., that we often find it better to have one built to suit.